The Csonka Automotive model is the most efficient and effective product for odor elimination in cars, campers, RVs, boats and all other locations that have access to a standard 12 volt DC outlet. It is wonderful for elimination of odors from all sources including: smoke, pets, chemicals and much more. The Automotive model's ozone output is more than adequate because when it's switched "ON", it will stay on continuously as long as there is power to the outlet. Its sleek style and easy to use design will surely be a source of relief in times of need. The Automotive model is available in a stealth black to compliment almost every d_cor. It is compact in size, roughly 3" wide x 4-1/2"deep x less than 2" tall. 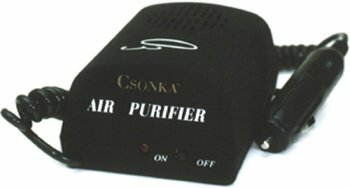 Like all other Csonka AirCare Purifier Smoker Cloaker models, the Automotive unit is virtually silent in operation. No dissatisfied customers means no returned products, 100% guaranteed! So try an Automotive model, or any other Csonka model today .